I get so many inquiries about art supplies for my classes and in general, so I have compiled a resource page with links to make it easy for you! Click the image for more info. I only recommend products I use myself or feel confident about based on others reviews. Feel free to email me with questions about any of these products (pros/cons), or with recommendations of your own. I’ll be adding products and updating this page regularly so check back often. Please note - there are affiliate links to Dickblick.com (my favorite online art supply store) and Amazon.com which will pay me a small commission at no extra cost to you. Thanks! I use a lot of different acrylic paints and as long as they are professional grade and heavy body, I don’t find too much difference between them. However if I had to choose the best quality, I would say Golden or Liquitex are comparable. The best value for price would be Blick’s own brand of acrylic paints. My go-to colors are Red Oxide, Yellow Ochre, Pthalo blue, Mars Black and Titanium White. These fluid acrylics generally are highly saturated and transparent. They are vivid and luscious as glazes over other colors, especially right out of the tube. A little goes a long way! They also have a natural sheen that accentuates their vibrancy. You can pour them right on your paintings or mix on your palette with other colors. Some of my favorite colors are Green Gold, Van Dyke Brown, Transparent Iron Oxide and Pthalo Turquoise. Blick also has high quality brushes in affordable prices. I love these stiff bristle brushes for acrylic paint. They hold their bristles over long periods of abuse, and since I rarely treat any of my supplies as precious, I’m glad that these have stood the test of time. PKB Select 3 Inch Silicone Color Shaper by Professional Artists Brushes. If you’ve taken my classes you know that I can’t live without this tool. It’s like a rubber squeegee and makes applying thick layers of paint a breeze. It has a flat beveled rubber edge and is flexible to add and remove paint in a variety of interesting ways. I like the 3”, and the 1.5” sizes. I’ve been using these palettes for years to keep my acrylics moist for up to a week or more. I have the large and medium sizes for use at home, and a small one for traveling. Make sure it comes with a sponge and palette paper. And when using, clean out the sponge at least once a week or you will have a science experiment on your hands. You can also order additional sponges and palette papers. I use acrylic mediums for so many things. I prefer a matte gel medium for collaging and photo transfer. 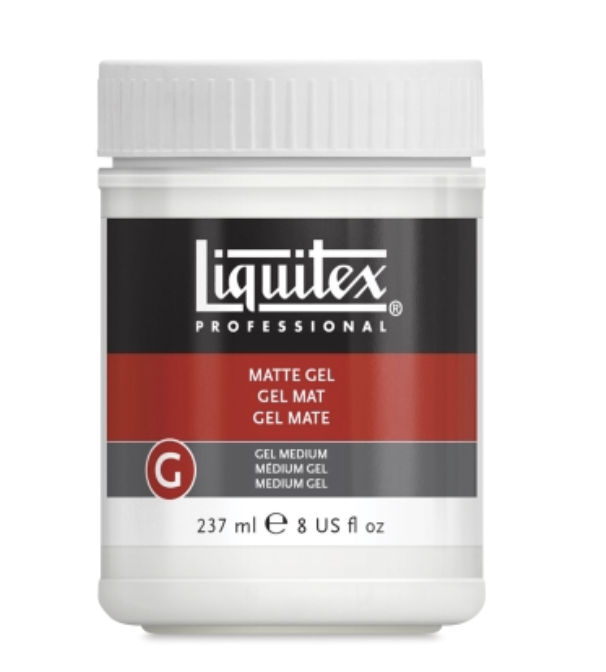 I prefer Liquitex Matte Gel Medium. Golden’s Fluid Medium is supposedly good for photo transfer, although it s a bit thin for me. I used to use the Blick medium but I think they changed the recipe and it’s become very thin and watery, so don’t recommend. A good basic white gesso at a great price. I’m always looking to minimize my supply costs because often the prices of artist materials are inflated. That’s why I like the Blick brand - it’s good quality, affordable, and has quick delivery. Blick offers various grades of gesso as well if you are looking for a more substantial body. I don’t use gesso that much so this works for me. I paint on paper a LOT. And Arches can’t be beat. I love the 140lb Hot Press (smooth surface, or Cold Press textured surface) watercolor paper in a natural white. It’s the perfect weight for paper that can take a lot of acrylic paint, texture, collage, digging, scraping, and again, abuse. 300 lb is also good if you want a very heavy duty textured paper. An interesting alternative to traditional paper is Yupo Paper. It's a synthetic paper made of 100% polypropylene. It has a very smooth surface with no tooth and is extremely strong and durable. The advantages of this paper are that it doesn’t warp or buckle from water, and because it is non-absorbent, the colors are rich and vibrant. I only use the 74 lb and like the 14” x 11” pads in bright white. These are the cradled panels I use all the time. 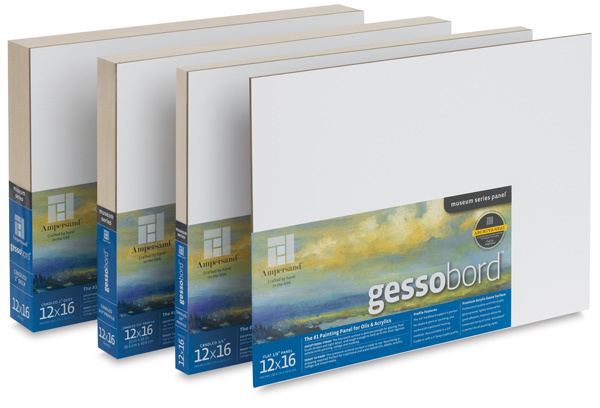 There are various primed surfaces you can choose from: Gessobord is slightly textured for any media, Claybord has a very smooth absorbent surface, and Encausticbord is for designed for encaustic but can also be used for acrylic painting. I like the 2” deep cradle but sometimes use the shallower depths. These cradles panels are more affordable than Ampersand and also unprimed, so you will need to gesso them if you want to start with a white ground. I like these for smaller works with a narrower depth of 3/4”. I haven’t tried the larger sizes yet so can’t vouch for their sturdiness, but the Ampersand large panels are very solid and worth the investment. This board is great for taping/stretching your watercolor paper down so it doesn’t buckle, as well as sketching out in the field. The 24” x 26” is great for medium or small sized watercolor paper. It’s easy to carry and has clips and a rubber band for holding paper when loose. And Blick, as usual, is great value. Artbin Essentials 3 tray box. There are lots of Artbin options for carrying supplies. I’ve been using this one for so many years - I might have even gotten it in art school way back when. The great thing is they are super sturdy and never seem to wear out. I like that this keeps my various supplies separated so they aren’t just thrown into a big box. I can find things when I need them! This hold-all bag is great for carrying your Masterson Sta-Wet palette so it doesn’t tip over. The palette fits separately and snugly at the bottom of the bag. Everything else fits in the main part of the bag, and the side pockets are great for phones, etc. R&F Encaustic Paints are really the only (and best) game in town, unless you want to make your own. (FYI, they are composed of beeswax, pigment and Damar Resin). These are top quality, have gorgeous pigments, and you can choose from their extensive color range. This link will take you to all of their products. I could gush on and on about these yummy oil pigment sticks. They are like budda! Seriously, these creamy oil sticks work brilliantly with encaustic paint, but also can be used on primed paper, panel, and canvas on their own. Wear gloves because they are soft and will get all over your hands. Click the link for the full delicious color range of options! I love to draw but sometimes I like some help, especially when drawing large images on to paintings. I’ve been using a pocket projector from Optima for years (to project images on to the panel for drawing), but my current projector is out of production. So I did some research and this one seems to be the best value. The pocket size makes it easy to travel with, and it can be attached to a tripod. Read the reviews and compare models for your needs. I use a lightweight portable tripod for so many things these days. This is a very affordable option for using with cameras and pocket projectors. I also have a small tripod adaptor to use with my iphone camera - both for still shots and video. One of the most popular techniques I teach is photo transfer. This technique only works with black/white laser or xerox prints on plain paper, NOT inkjet prints. I do so much photo transfer that it made sense to buy my own laser printer instead of shlepping to Kinkos to make xerox copies every time I wanted to do a transfer. This black and white laser printer is under $100 and does the trick. I bought this for a recent artist residency to Ireland, to keep my brushes and other supplies safe from damage and in one place. There are slots for brushes and other long handle tools and also a see through pocket for paints and other items that might leak. I LOVE this travelers notebook COVER in the A5 size because I can make my own watercolor paper inserts and change them out when they are filled up. They also fit field notebooks if you just want to use them for writing and light sketching. The A6 size is smaller and also works with watercolor signature inserts. 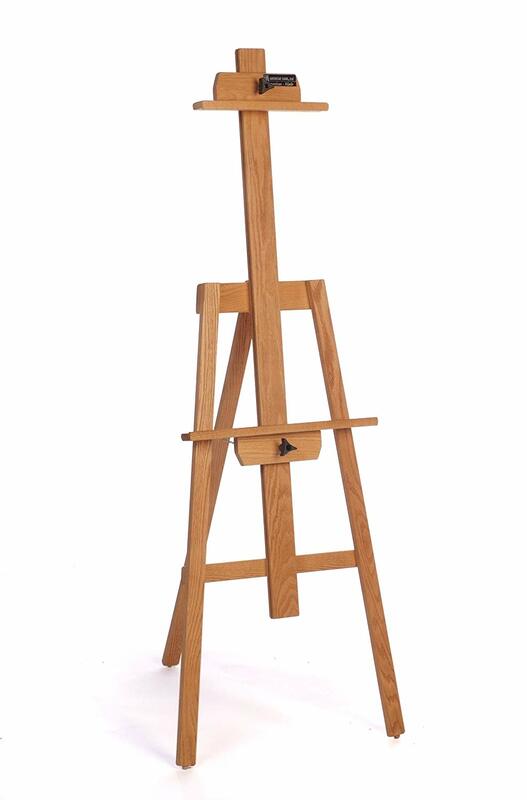 This is a great sturdy stand up easel for painting on medium/large canvases or panels. I’ve had mine for at least 20 years and it still works perfectly. It folds up relatively flat for carrying in your car when going on painting road trips. It’s fully adjustable and can support canvases and panels of most sizes. I recently bought this tripod easel for traveling. It’s lightweight, collapses to fit in my suitcase (with it’s own carry case) and can be used on a tabletop or as a full size standing easel. It’s not great if you are painting large or need a sturdy easel, but it’s perfect for travel and working on anything smaller than, say, 24” x 24”. Most art supplies are overpriced, so I buy some supplies in bulk from the paint department. 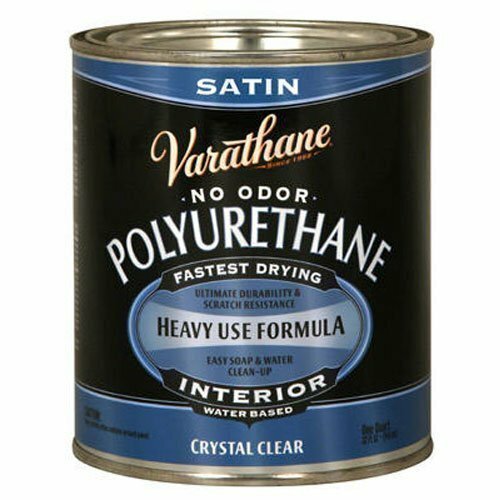 This odorless satin varnish gives a nice low sheen to my paintings by bringing out the colors and the textures in a subtle way. It also protects the painting from low impact. 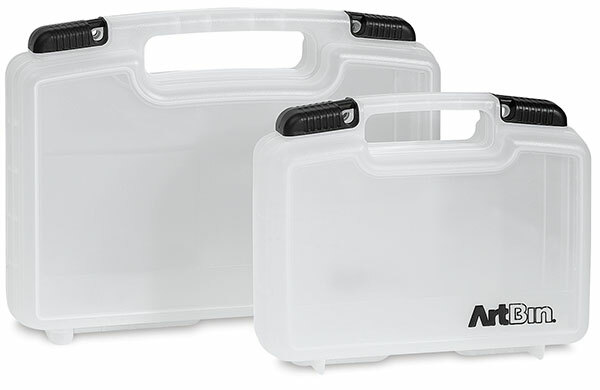 Artbin wrote the book on lightweight carrying cases for art supplies. These shown are just a few of the many options. I use the smallest one here for my art supplies when I travel as it fits well in my suitcase. I combine this with the Silver Brush Travel Case to hold my minimal art supplies while traveling. This might seem like a boring product to include here but my students are always asking for the best kind of tape to use when taping watercolor paper to the boards for stretching. Masking tape is too sticky, and “artist tape” is a waste of money. And I really don’t recommend the blue painter’s tape because it affects your sense of color when painting. 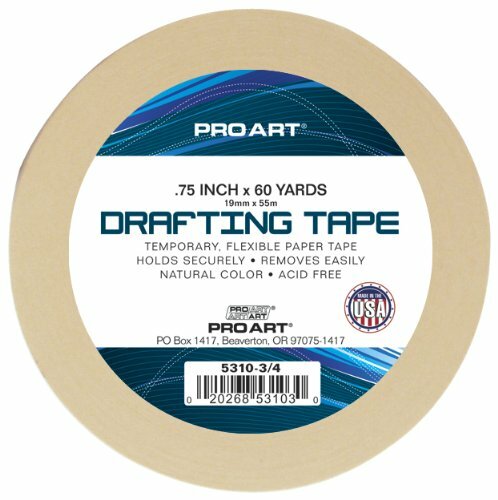 This drafting tape is the sweet spot.